Its the second year of Sync Conf renamed NorDevCon this year and the organisers are already looking forward to NorDevCon 2015! The conference was at the Kings Centre this year which is nice venue and a bit of the main street but still pretty central to Norwich. I was a bit late arriving due to confusion involving parking + jobsworths + ticket machines and then ran quite a lot of the way. Once my heart had slowed down a little and I had tea’d up, I took a meandering route through the conference and saw a wide range of different sessions. These are the ones I got the most from. Pete didn’t really talk about Heroku so much, there isn’t a huge amount to say, more about how he uses it as part of his prototyping process. Its a simple and cheap way of getting ideas online and iterating until they are a success out growing Heroku or are abandoned. He also talked about how he validates whats working by providing dashboards accessible to everyone on the team via products like analytics link tracking and intercom.io cohort engagement tools. Pete said on the whole people who did signup reacted with a fair enough when an idea is closed down. This was a great laugh with Harry and Rupert playing at times variously computers, customers, blue peter presenters, stationery fetishists and even developers. They were demonstrating building an early prototype of a system to create quick feedback and validate decisions made. There were some really good ideas here about developing and failing or succeeding faster. If you can do it in paper with a marker pen in 10 minutes with some users its got to be better than going away and coming back weeks later with some hard coded prototype that fails in the face of the customer within minutes. There were some neat benefits as well for gathering requirements removing barriers to feedback and disabling consensuses in meeting rooms. Harry said that an important book for them had been the Paper Prototyping by Caroline Snyder. It was interesting how Boydlee goes about his own and his companies mobile development. He went through the choices he makes about which providers he uses and the hosting decisions he makes (Rackspace perhaps more expensive but very helpful support) and the when and why to use Appcelerator or Native development. Also the providers of mobile back ends MBAAS and services such as push notifications. Cyrille gave an outline of things to avoid when scaling your applications amongst other things remove/abstract files/logs/config etc, using CDNs and AWS S3 security tokens. He also talked about blue green deployment which was an idea I hadn’t come across before. Ok to be honest this made my brain slightly ache, having never really looked at any Go the syntax hit me quite hard. But that is good :) Really interesting though and Eleanor is very enthusiastic and added Go to my list of languages to explore further. As always with these things you learn as much from your fellow attendees as from the speakers and it was nice to meet with some people I hadn’t seen for a while. So thank you to the organisers and heres looking forward to NorDevCon 2015. Norwich Ruby User Groups fascination with fighting Badgers and Foxes continued this meet up. The blood sport took place at Furthers offices on the evening of the 17th of December. Paul started us off with brief heads up on continuous integration and very kindly distributed copies of a his continuous integration 101 booklet. Some discussion ensued and questions were batted back and forth. People had evolved different integration solutions to meet their particular problems and languages. We divided into two groups and started on improving the NRUG Battle Critter™ battleships game. Integrating our code to the NRUG server as we coded and asked Matthew random questions. As usual abilities and familiarity with the technologies varied widely but much laughter was had by all. Coding was powered and aided by home made mince pies and mulled cider provided by everyones favourite Ruby couple the Bennett-Loveseys. We ended with a battle best of three to test who had created the best algorithm. Blue team won the battle but as a Red team member I felt our excuses edged it on the night. Marc was particularly inventive when faced with possible defeat. Plus I found how to fix my weird display issues in virtual box, a new yiddish word, Apple should put their laptops together better, Southwold has got fibre and how do you actually get to MMK without teleporting. This article was originally written for Norfolk Tech Journal. Went to the first SyncConf on Thursday. It was pretty varied conference with a good spread of people and talks. There were two tracks agile and tech, I went back and forth between them. The sessions I went to went to were. Some lessons learned from presenting complex data to people and people allergies to graphs. Lots of info here on what was to me a new idea – graph based databases. Seems a great idea for the types of situation where it would excel. I’ll be trying this out on my machine to see what it can do. Not so much what BDD is or at all codey but trying to analyse in what situations BDD is a good fit and using BDD as part of the discovery process on a new project. All about Phils’ experience of creating a ‘Risk’ based iphone game in his annual leave. Also about objective C and its origins. How Andys team at the guardian monitor their site as they update it. Also their mobile site architecture and the directions they are moving towards when resources fail. Which resources are absolutely necessary for the page and which are secondary. Making sure you always deliver the essential news element. Sean talked about his experiences story of multimap from founding through to eventually selling to Microsoft. He then went on to describe what an Angel investor wants to hear in your pitch. Based on his experience as an Angel investor. The organisers Paul and John are planning for next year already. Its great that there is a technology conference in Norwich, lets look forward to future ones. Benjamin Mitchell came to talk to Sync Norwich last week. Lots of the ideas seemed familiar/evolution from extreme via scrum. Seemed Benjamin was moving from an unproductive scrum environment towards trying to create a more dynamic and effective process. So he was constantly evolving the processes and systems his team was using towards a more efficient system that could more adequately estimate how they were going to complete. He also had some good examples from some rather ‘broken’ sounding large organisations he had worked for. Having to do demo on the fire escape to avoid the agile hating boss. Testers who were paid by the test, so producing a lot of tests of not much value. Even applying systems you might use at work to your kids problems. Kanban dad? Cue some getting to know the other people in your team/organisation activities. He was also keen on paper systems, he would rather track progress by moving post-it notes on a grid on the wall that everyone can see instantly. Rather than by using a fancy computerised tracking system. He found post-it’s easier to adapt and if he wanted to change the way they ordered the process it was just ripping some masking tape off a wall and moving post-its. Went to Wordcamp on the weekend of the 14th-15th of July. Congratulations to Tony and all the other responsible adults. Learn’t lots of stuff met interesting people and expanded knowledge of Edinburgh so all good. WordPress and Web Accessibility: Why It’s Important – Its always good to be reminded that not everyone is similarly able and always worth bearing in mind as you build web stuff. Went to a ‘Introduction to AWS | Cambridge’ on Thursday. It was interesting to see what they had to say and what people are using their systems for. They gave an idea of the size of things like S3. The numbers are off my scale of comprehension, too many zeros. Guy called Ianni demoed provisioning multiple servers, set a system with a load balancer and two servers running a demo site with a single config script. Which was impressive in itself but then he setup another server to use jmeter which then put a load on the demo site. Then he went on with his talk, by the time he came back to the monitoring panel at the end of his talk his servers had autoscaled to 18, very neat. Gave an idea of the different approaches you can take when the infrastructure is on demand. Server stopped in middle of the night, automatically bring up a new instance to replace it and then sort of why the original server broke, when your more awake. He also used windows which I was surprised by, not that I’d tried but I assume the vast majority of users would be using various linux flavours. A couple of users gave quick sessions about what they were using AWS for, genomics, on demand desktops and business applications. One thing I learnt about was the spot pricing amazon offer if you have task you want done but isn’t so time sensitive you can put down a price your willing to pay. When the spot price comes down to the level your willing to pay, you get your provisioning. The other attendees at events like this are usually quite interesting spoke to a guy using AWS for his asterix servers, big savings over his old physical servers apparently. Another guy who was using S3 for mobile phone application storage and someone else who was wondering if he could use multiple GPU’s for imaging. Was reading ‘The Lean Startup‘ after John Fagan gave a talk at Norwich Startups group. It made me think about the similarities between the Lean Startup Process and unicycling. Startups are inherently unstable and usually end in a crash. When your learning to unicycle its the same thing your constantly adjusting and pivoting to adjust to new information that your taking in the whole time. The situation is never stable and even if it appears to be for a while your just one bump away from a tumble. Generally I think that Eric Ries has some useful ideas although its a bit tech focused. He describes the general ideas in part one how to measure/test in part two and then growing/adapting in part three. I thought he would run out of ideas after part one and just repeat himself but the rest of the book was useful, part two more than part three. Its a bit self serving, he talks about organisations he works for and is involved with but I guess that means he can provide accurate examples. Its also a bit religious, like this is the only way. I’m sure it isn’t, like all ideas you take the useful bits for you from it. Some of it will seem familiar to you if you’ve read about Lean the Toyota Way, Six Sigma, Deming and all that. Cohort metrics – measure a cohort of users so you can compare them with earlier cohorts, to measure effectiveness of changes. Experiments – A/B split tests that you can actually get useful and unambiguous information from. Five Whys – keep asking why until you get to the root cause of the problem. 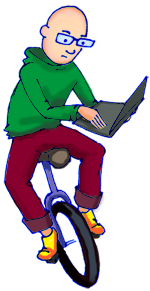 When you watch unicyclists they always make it look easy, its not, I guess its the same for successful businesses.